Review: There are some things people don't dare to talk about. Most of those things are about the woods. Phoenixes, griffins, dwarfs, magical ladies, and a dragon living at the top of a great mountain haunt these woods, yet nobody has the guts to speak of them. They whisper to you and listen to your dreams as you sleep. They are the forest folk. The woods move in more and more bit-by-bit everyday. 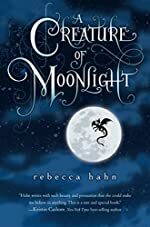 An addition to the other books this amazing author wrote comes the book A Creature Of Moonlight by Rebecca Hahn, as magical as it sounds. Taking care of flowers in a muddy garden since you were able to move around sounds like a lot of work, but it's even worse knowing that you are a born princess and heir to the throne yet you dig around in the dirt all day. The russet-haired Marni has no idea who or where her father is, she only knows that her evil uncle has murdered her mother and she was sent to live with her grandfather for all eternity. People are usually scared of her because they think she is the dragon's daughter, for no one knows who her father is. Legends are told that girls, especially girls with no fathers are called the daughters of the dragon, no one knows why exactly. Things are usually quiet in and around the hut, but when Marni comes back from her trip to the woods one day, she finds The Lord of Ontrei in her grandpa's chairÉ her grandpa is dead, or is he just gone? Marni is now on a double quest to get revenge from the king and to find out, who exactly is her father? Any teenager or even young adult would immediately loose themselves in this A Creature of Moonlight, and the magical forest. Experience the taste of freedom as you fly across the sky with Marni or when you run with the wolves on the forest floor, bounding gracefully and avoiding all the massive trees. This book is for anyone who loves mysteries, mythical creatures, and magic (The 3 M's). Any child or even a young adult will fall in love with this book, others sure did. Come along with Marni on crazy adventures anywhere from the king's land to the enchanted woods. Relive the night of the murder when you come across the small hut in the forest. Get scared as the magical lady in the woods sings you her dark lullabies. Find out what life is about as you listen to the conversations between Marni and her family members. Jump into the book and help Marni find out, is her father the dragon living at the top of the mountain, and is he sending his magical forest to capture her?